This essay results from a half-century spent observing the development and stagnation of a once vital music form, jazz. Curiosity spurred its evolution when a successor to John Coltrane failed to emerge within a few years of his early death. 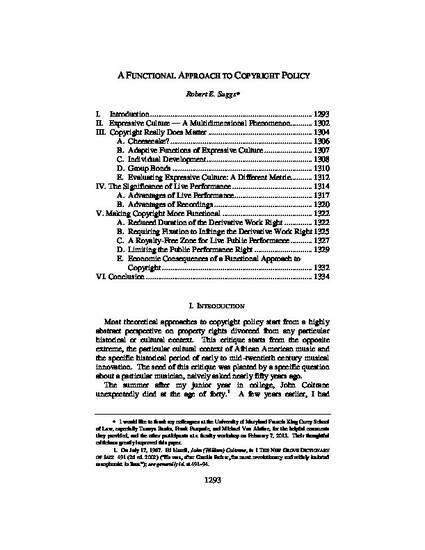 Over the ensuing decades, I became concerned that advancing technology and the 1976 Copyright Act had fundamentally undermined our cultural ecology. Unnoticed over the past century, technology has changed our experience of expressive culture, (the stories, images, and melodies that copyright most strongly protects), from live performance in social settings to solitary consumption of recorded media. Neurologically and physiologically this differentiates our experience from all earlier societies. Expressive culture evolved over millennia, and its presence in all human societies suggests it plays a vital social or psychological role in our struggle for survival. Long before the development of markets or mediums of exchange, expressive culture flourished everywhere, even in the most marginal subsistence societies. If expressive culture performs essential functions, then it is long past the time to consider what these functions might be. In examining expressive culture, the essay first considers its complexity, especially the variety of ways in which it is created and experienced. It attempts to answer the fundamental question. What is the purpose of expressive culture? It examines the functions that music, images, and narratives, might serve in human and social development and considers what the implications might be for copyright policy and possible reforms. 83 University of Cincinnati Law Review 1293 (2015).